Make QR codes that anyone can scan with the iPhone Camera app to perform actions. Share with friends, print out posters, show your favorite code with Siri, and much more. The Visual Codes app creates QR codes that anyone can scan. With the built-in iPhone and iPad Camera on iOS 11, users simply point their phones at a code to scan it and perform the action. The codes also work with many other barcode-scanning apps and devices, including most Android phones. Open WebsiteOpen a web browser to the specified URL. Search WebSearch the web for a word or phrase, with the user's chosen search engine. Compose MailStart an email with the 'to' field prefilled for a particular contact. 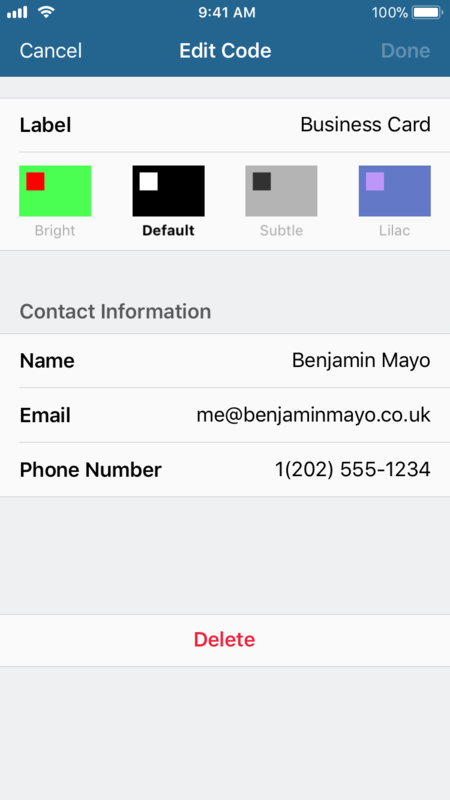 Add ContactCreate a new contact in the user's address book. Map LocationShow a place in the world on a map, using the device's native Maps app. Call Phone NumberDial a chosen phone number. Great for businesses. Connect to WiFiDon't mess around with typing passwords. Quickly connect to a WiFi network, just by scanning the code. To create a code with the app, just tap Add Code. Select the type of action you wish to create and you're done. It's that simple. Try it out yourself. The code on the leftabove was made with Visual Codes. Using an iOS 11 device, point the Camera at it. It will open Benjamin's Twitter account. Codes are automatically saved to your library, so you can access them later. Drag and drop to put your most-used codes at the top of the list. Scan from within the Visual Codes app. Just tap Scan Code from the Add Code screen. Point your iPhone or iPad at a QR code to scan. Just focus the viewfinder on the code ... and that's it. 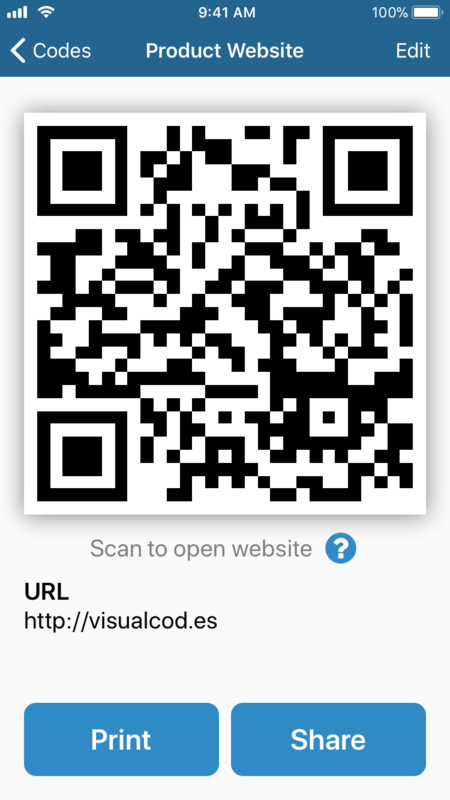 Visual Codes understands the content of the QR code and presents its details in a human readable form. Open links, contacts, and much more. 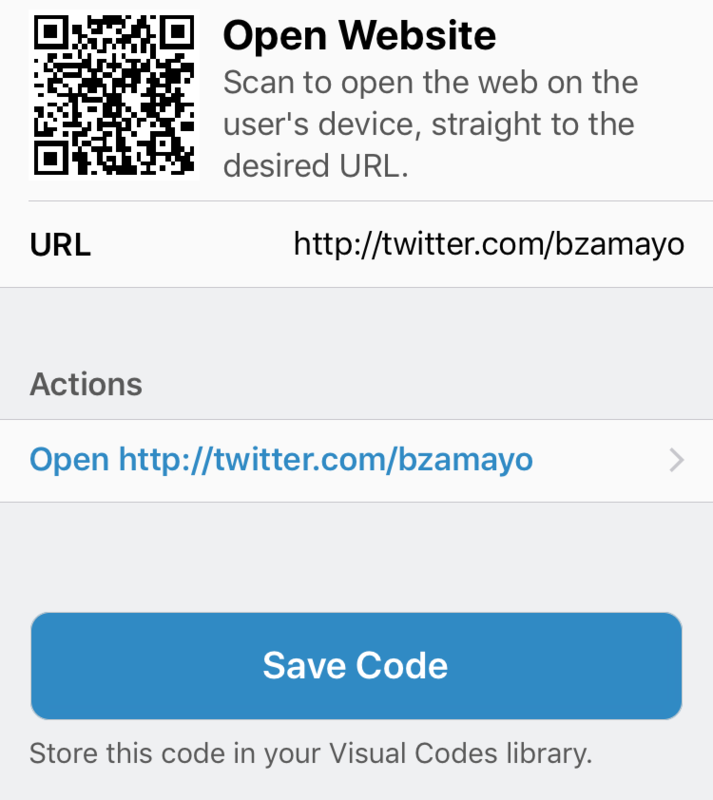 If you scan a code you want to keep for later, tap Save Code to import it into your own Visual Codes library. Scanning and importing QR codes has never been this simple. QR codes can be scanned directly off the iPhone or iPad screen. Or share codes to Twitter, Facebook, email and other services. Visual Codes features advanced printing options. Grid mode prints multiple copies of a QR code per sheet. Print as Poster to fill a single page with a full-size QR code, and optional heading. Hang on a wall or shop window, to be scanned from afar. Access your favorite QR code without even opening the app. Siri can show your Pinned Code at any time, with a simple voice command. 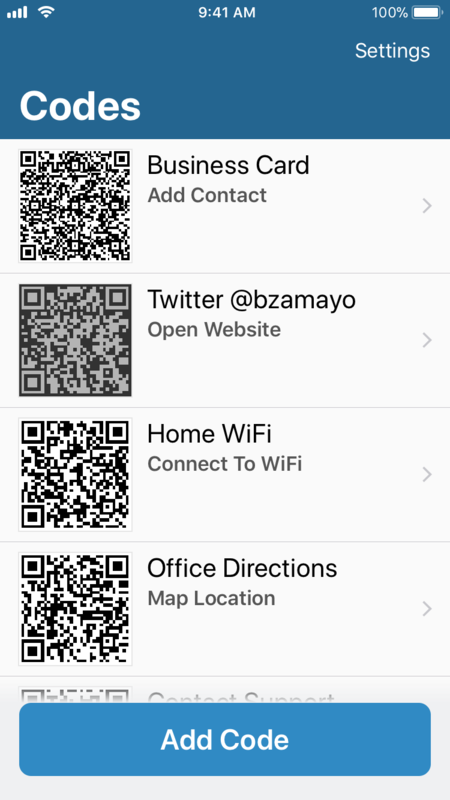 For example, set your home WiFi QR code as your Pinned Code to quickly access it when friends come over and want to connect to your WiFi. QR codes don't have to be black and white. Pick from four code styles to spruce up the color palette. The Bright style catches the eye, whilst Subtle blends in. To change appearance, open the Edit menu and tap the selected style. Visual Codes for Apple Watch mirrors the code library from your iPhone. 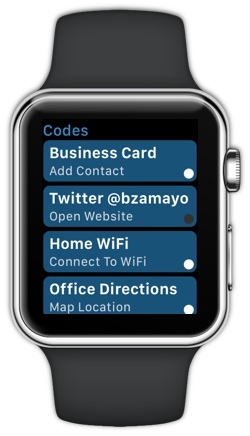 Use the Digital Crown to fly through your codes in the Watch app. Turn your wrist to show the QR code to someone else. Visual Codes automatically rotates the display and keeps the screen lit. The Watch app is available for free, bundled with the iPhone app. Download Visual Codes from the App Store to get started. Get Visual Codes from the App Store today, for free. A modern QR code generator for iPhone and iPad. Some features require a one-time In App Purchase to unlock. Already have Visual Codes? Email for help and support. Member of the press? Get the Press Kit. Designed and developed by Benjamin Mayo.